Julie Magers Soulen photographs pop, as we would say on Etsy, they capture life for all time. I have selected a few of my favorites for this article. You may view Julie’s work at: juliemagerssoulen.blogspot.com, juliemagerssoulen.etsy.com, juliemagerssoulen.twitter.com,and juliemagerssoulen.facebook.com; visit her websites to view her dipictions of life in the American west. The above photograph reminds me of a spot in Crestline, California, where my parents scratched their initials and the date on a tree. The photo of the bluebird is both simple and profound. God is definitely in the details! In the above photo it looks as if the sky has a ceiling. An amazing cloud formation! 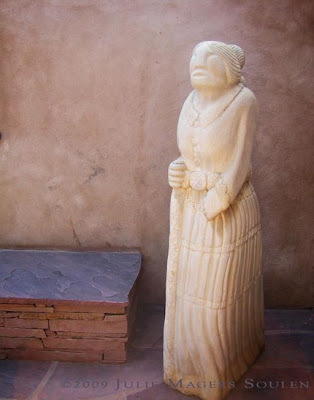 I enjoy Native American art and culture and the above statute is incredible. So take a break and view the phenomenal talent of Julie Magers Soulen Photography.